Thank you again, dear Peter, for planning, organizing, and producing such an elaborate and all-inclusive course in singing and particularly for including us and encouraging and supporting and also coaching us in becoming much more focused and polished singers and happier human beings while letting us become honorary members of the Village Squires for the duration of the course and the final performance. I attended the ‘Canada A Cappella' event last evening at the Dave Dunnet community theatre and thoroughly enjoyed the show. The Navy uses the letters B & Z as a signal for ‘Well Done'. 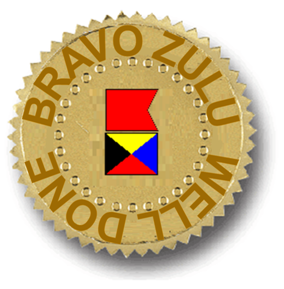 It can be flags, voice, morse code, or in some written form but Bravo Zulu is the seaman's well done. The Submariners Association of Canada West has made up a BZ logo for use at appropriate times. I believe that this is one of those times and therefore I (as the past President of SAOC West and the designer of the logo) award both the Village Squires and the City of Gardens Chorus a Bravo Zulu ? very well done indeed. While I know that your members heard the appreciation of the entire audience last evening I would appreciate you passing my personal appreciation along at your next gathering. S'il vous plait et merci. Take care and mind your bubble!